The page outlines the Vision, Mission, goal and objectives of the society. It also outlines the countries included in the organisation. SOUND HEARING 2030 is an initiative for the prevention and elimination of hearing impairment. Its key function is improving the quality of life of persons with hearing impairment through development of comprehensive, inclusive, and sustainable ear and hearing care programs at national and sub national levels. This would be by facilitation, guidance, technical support, sharing of information, monitoring and evaluation, all in collaboration with National Committees and all stake holders of target countries in the South East Asia and other regions. In 2002, the Recommendations of the WHO Inter-Country Consultative Meeting in Colombo stated that an institutional structure needs to be put in place for all the stakeholders to move on and provide a mechanism for regional cooperation among SEA countries in relation to all aspects of deafness prevention and ear and hearing care. This led to the launch of the Sound Hearing 2030 program. The Society for Sound Hearing (SSH) has been ratified at the first General Body meeting in Bangkok on the 4th of October 2005, with the initial support of WHO SEARO and CBM. It is a permanent New Delhi based international organization with representations from professional societies, governmental focal persons, international NGOs, agencies, and active individuals. VISION: To improve the quality of life in the Asian Region by including in developmental programs the RIGHT TO BETTER HEARING. MISSION: To eliminate avoidable hearing impairment by the year 2030 through development of sustainable and inclusive ear and hearing care systems. GOAL: The Goal of the SOUND HEARING 2030 program is to reduce avoidable hearing impairment to 50% by 2015 and 90% by the year 2030. To raise awareness at all levels within the community. To promote sustainable and comprehensive ear and hearing health care. To facilitate the increase of appropriately trained community oriented ear and hearing health care professionals and personnel. To enhance access to appropriate ear and hearing health care. To advocate and promote sustainable and comprehensive ear and hearing care, as national health systems development. COUNTRIES INCLUDED: The countries included at the start of the regional organization are eleven countries, in accordance with the WHO regional division. 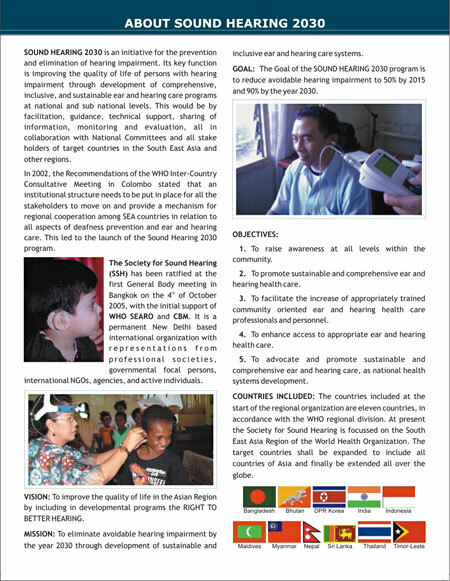 At present the Society for Sound Hearing is focussed on the South East Asia Region of the World Health Organization. The target countries shall be expanded to include all countries of Asia and finally be extended all over the globe. The countries include: Bangladesh, Bhutan, DPR Korea, India, Indonesia, Maldives, Myanmar, Nepal, Sri Lanka, Thailand, Timor-Leste.